Surrounded, and partially divided, by the high peaks of the Carpathian Mountains, the fabled, mountainous region of Transylvania in central Romania has become synonymous with Bram Stoker's Dracula, but on this wonderful seven-night guided holiday we leave fiction behind to uncover a beautiful country with a rich and fascinating history. The region presents a splendid mix of medieval castles, high peaks, incredible wildlife, and of course - welcoming and warm locals. Steeped in tradition, it's easy to see where the inspiration for the tales came from. Starting in Sinaia, our walks begin at the foot of the Bucegi range just a couple of minutes from the fairytale castle of Peles. From here the walks take us across high mountain plateaus and through beautiful wildflower-covered pastures, where you can see rare birds and butterflies. Our paths lead on through ancient forests and rocky canyons - home to black chamois, lynx, brown bears and even wolves - to medieval villages. We visit the famous Bran Castle, a Gothic fortress that was the setting for Roman Polanski's 'Dance of the Vampires' as well as a place of refuge for Queen Mary of Romania. Then in towns like Brasov and Pestera, we explore medieval squares and winding alleyways, whilst marvelling at Gothic, Renaissance and Baroque buildings, including the famous clock tower and the house with the deer antlers, where the real Vlad Dracula was born. Your accommodation for the week offers a blend of high quality hotels and spectacular views; from the ***** chalet-style Villa Oblique in Sinaia and the elegant **** Casa Din Bran Inn Center, to the **** Nobillis Carpathian Residence, the *** Safrano Palace located in the heart of Brasov and the more rustic Transylvanian Inn.To complete the package, we've also included all meals. Walks are on forest tracks, mountain paths and quiet country lanes, there are some short steep accents and descents. Many of the walks at 1000+ metres, and some cold weather clothes would be useful. Walking boots are essential, waking poles recommended. We pick you up from Bucharest airport and transfer you (1.5hrs) to Sinaia in the Bucegi range of the Carpathian Mountains. Scenic drive to the start of today's walk to Bran with stunning views of the Piatra Craiului Massif. In the afternoon we visit Dracula's castle, the setting for Roman Polanski's 'Dance of the Vampires', and a refuge for Queen Mary. The night is spent in Bran with dinner included at the hotel. A short transfer to the start of today's walk over meadows and pastures to the mountain village of Pestera. On the way look out for orchids, gentians, campanulas and endemic flowers like the 'Carpathian Iris'. Enjoy spectacular panoramic views of the surrounding maintains and picturesque landscapes. You will spend the next two nights in Pestera with dinner included at the hotel. Today's circular walk takes in some of the best views of the region's mountains and valleys with opportunities to spot rare birds and butterflies. This morning we walk through the beautiful Prapastiile Zarnestilor gorge which has been used as a filming location for the movie Cold Mountain and is home to creeper, alpine swift and also the elusive three-toed woodpecker. We then make the climb up to the rustic Curmatura mountain hut where we will enjoy lunch (included) and a well-earned rest before descending again into Zarnesti and a transfer to your hotel in Predelut. Dinner is included at the hotel this evening. Visit Rasnov Fortress before starting a walk along the Sticlariei Valley as it descends to the medieval town of Brasov, where we visit the town square, surrounded by Gothic, Renaissance and Baroque Patrician buildings as well as the Gothic 'Black Church' with its world-famous Buchholz organ and a rare collection of oriental carpets brought back from trading missions to the Ottoman Empire. Stay in the centrally located Safrano Palace with dinner included at a local restaurant. Group transfer to Bucharest airport. 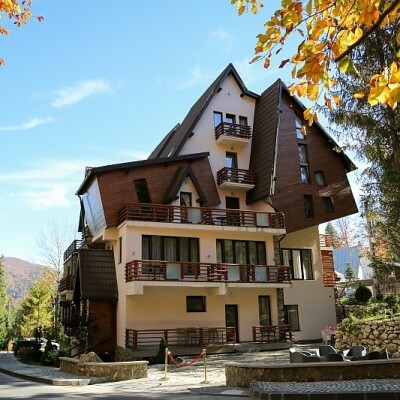 Just 500 yards from Peles Castle on the hill above the town of Sinaia is the ***** guesthouse Villa Oblique. Opened in 2014, the Oblique is a modern, chalet-style building that offers free access to the onsite spa, featuring a sauna, a steam bath and a hot tub. Rooms at Oblique are individually decorated to a high standard and come with superb mountain views; many also have a balcony. Conveniently located within a 5 minute walk from the history, the myth and intrigue of Bran Castle, this elegant hotel has 15 elegantly styled and comfortable rooms. Enjoy traditional Romanian cuisine in the restaurant, which also has a large outdoor terrace for alfresco dining. High on a hillside with unrestricted views of the Bucegi and Piatra Craiului Mountains is the Nobillis - Carpathian Residence. 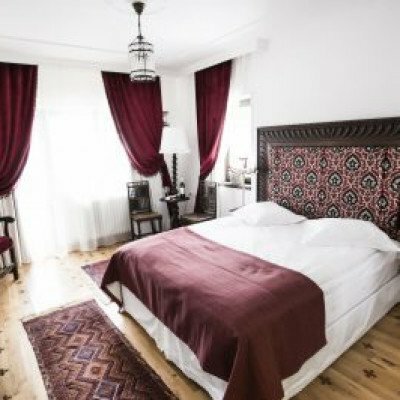 Recently built, this cosy **** hotel offers a garden, a terrace, a Finnish sauna and a Turkish bath, and the hotel's restaurant serves Swiss cuisine that can be enjoyed in the large dining room. All rooms feature a large balcony with spectacular views and are elegantly furnished with solid dark wood furniture. Perched on a hillside with panoramic views over Bran Castle (just 2km away), Ra?nov citadel and the Bucegi Mountains, is the charming family-run Transylvanian Inn. The hotel offers comfort and tranquility along a quiet lane away from the popular town of Bran and the views from the terrace are second to none. Guests can dine on the terrace as the sun sets behind the mountains, enjoying traditional Romanian dishes made from fresh, local produce with superior local wines. Rooms are modern and comfortable, with earthy tones in line with the surrounding nature. 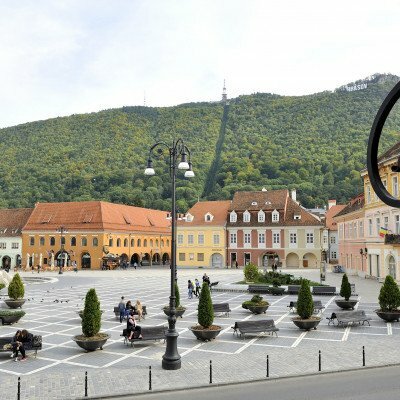 Located in the heart of medieval Brasov overlooking beautiful Council Square in the cobbled old town. Surrounded by colourful Baroque buildings and lively cafes, the hotel is central to Brasov's main attractions. Beautifully decorated and comfortable rooms, all with amenities such as flat screen TV and minibar. Transfers included from Bucharest airport at 19:10 and back to Bucharest airport at 14:30. A variety of walks and sight seeing made our first visit to Romania enjoyable and interesting. We found the countryside beautiful and our various hosts welcoming. We had a very good experience and would like to visit again. I would recommend talking through the fitness requirements with Headwater when choosing this trip. We were all except for one, over 65, and although we were fit the walk was tougher than we expected and if the weather had been unkind we would have found it much harder. Strongly recommend taking sticks. Very interesting place to see. Beautiful landscapes mountains, forests, villages you saw it all! An excellent holiday exploring Transylvania and the Carpathian Mountains, with plenty of variety - and we really enjoyed the historical/sightseeing elements. There was a good mix of scenery/landscapes when walking (the area is extremely attractive), however we did feel that there were some very strenuous sections to some of the walks which were definitely harder than the level 2 that the trip was graded at. The hotels were excellent and very comfortable, often with stunning views and all in excellent locations. Food throughout the trip was plentiful and tasty, we particularly liked our lunches in local villages. Despina, our guide, was professional, knowledgeable, helpful and fun and made sure we had an extremely enjoyable holiday. We would definitely recommend this holiday. A fascinating introduction to Transylvania with a mix of serious hikes, gentle strolls and sightseeing. We had a seriously unpleasant windy/cold introductory long hike followed by perfect (but apparently unusual) weather for the rest of the week. The tour two weeks earlier had apparently experienced hot (30+) weather and crowds. Lovely hotels, great tour guide. A very good balance between walking and sightseeing without too much travelling by coach. Beautiful scenery and flowers. Walking at times 2 1/2 boot not 2. Food variable -evening meals in Sighisoara poor. A restaurant rather than another hotel would have been better. Sightseeing very enjoyable and interesting. The holiday provided a very good balance between the walking element that one normally expects from Headwater and the opportunity to view the many historic castles, fortified churches, and villages. However some of the larger attractions, e.g. Bran were a lot busier than anticipated. The meals were good, and in particular the lunches were both generous and interesting as some were provided by the welcoming local villagers in the remoter locations visited! Despina our guide went out of her way to organise additional activities, e.g. a morning visit to the monastery in Sinaia, and was generally knowledgeable and helpful throughout. Excellent from start to finish-from initial enquiry to booking through Operations to on the actual on the ground Guiding. Romania is a beautiful country with really nice welcoming people. Our Guide Dispina was excellent couldn't have been better also our driver was always on time at the right place and very helpful and considerate. Can recommend Headwater and this holiday without reservation. Only slight issue is for any elderly,frail travellers the hotels don't have lifts ( except Belvedere) nor Portering( except Fronius) which can be a problem for rooms above ground floor.It didn't affect us as we are pretty fit but could be a problem for others.Also Hotel Belvedere is out of town and very upmarket and smaller friendlier hotel or guesthouse would be better. This is a varied itinerary consisting of walks and sightseeing in a small area of Romania. It's described as intermediate level and there were some steep sections but the walks were not overly long - longest about 7 hours including lunch at a mountain hut. The scenery is beautiful and the villages, castles and towns visited very interesting - Romania has a complex history. The wildflower meadows were an absolute delight, identifying some species quite challenging! The hotels we stayed at were good, Fronius Residence is a beautiful building. We did have 2 rooms in other hotels with dodgy shower drains which we reported. Eating establishments were all pretty good, traditional food which was more than acceptable. All coped well with people in our party who required gluten-free food or were vegetarian. Our guide, Despina, was exceptional. I cannot praise her enough - her English was excellent and she was intelligent, informative, helpful, receptive and also fun. She could explain to us the history, politics and culture of the country. She also coped very well with any difficulties that arose, going out of her way to visit a pharmacy for treatment for a damaged foot. Her sonic dog repeller was magic - there are a lot of dogs in the rural areas! Personally I would have liked a little more walking and a little less lunching in the day times, though the lunches in open barns in Saxon villages were charming. There was certainly one day when we walked from Cris to Malancraz for lunch when I would have liked a further walk in the afternoon to another village. All in all a very pleasant holiday with good company - interesting people and we all made the effort to gel together as a group. I have not been on a group holiday like this before - we normally travel independently, but I found it an agreeable experience which I would repeat in the future. A lot of walking and a lot of Sarmale (cabbage rolls) if you don't like both then maybe not for you! This was a real 5 star holiday. The scenery and walking were fabulous and it was great to end every day at wonderful hotels in superb locations. The local rep was brilliant and her local knowledge of the area was superb. Can't fault the holiday in any way. Great holiday taking in some stunning walks and 'bucket list' site seeing. We were lucky with our group and guide, great fun, and fortunate to have a week of sunshine. All the hotels were welcoming with good food and comfortable rooms. Beautiful scenery of rolling hills in vast valleys with wildflower meadows, exceeded expectations. Be prepared for a lot of climbing up & down hills. Extremely cold our first day as 2000m high & still some snow lying, so warm clothing needed! First day was long descent & we have recommended to guide that might be an idea to alter this walk slightly. Renate our guide was excellent & went out of her way to help us. Hopsitality, accommodation & food was superb, especially at the Hotel Nobillis. A minimum of 6 people (in total) are required for each departure. Selected Saturdays from 25th May 2019 to 28th Sep 2019, for 7 nights. All dates are subject to availability, please contact us to check. 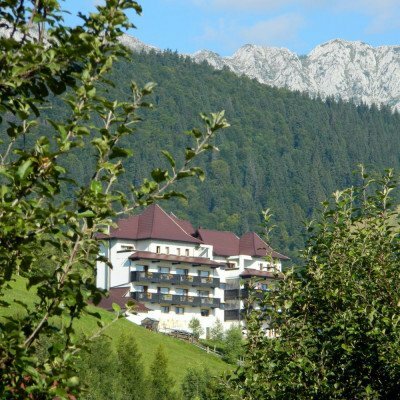 Due to the tailor-made nature of our holidays, we need a little more information in order for us to check availability for Transylvania and the Carpathian Mountains. Simply complete the form below and a member of our sales team will contact you (when it's most convenient for you) to provide availability information, travel options and an accurate price. Of course there's no obligation, but if you do wish to proceed with a booking they will be on-hand to assist you throughout the process.